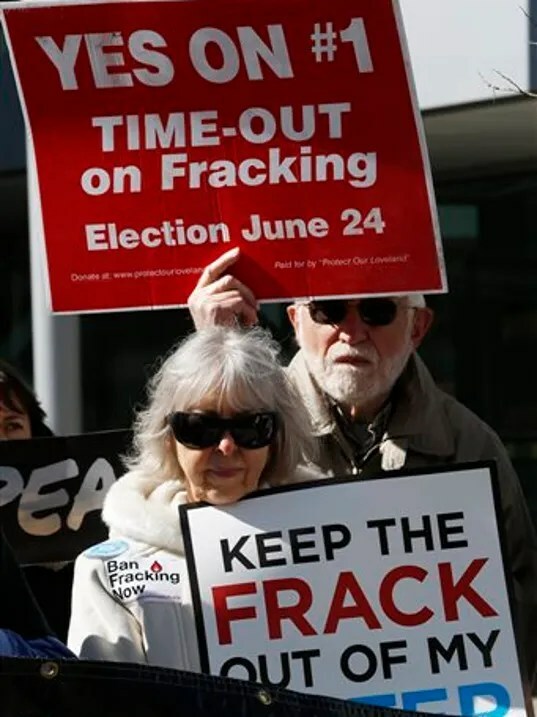 Committees fighting proposed Colorado ballot measures that would limit fracking have raked in about $15 million in donations this year, more than 35 times the contributions of groups backing the measures. About 90 percent of the anti-ballot measure donations have come from energy companies, including $10.5 million from Anadarko Petroleum Corporation and Noble Energy alone. In contrast, individual donations of less than $1,000 have been the primary fuel for the pro-ballot measure efforts, bolstered by support from U.S. Rep. Jared Polis, his father and the executive director of the fundraising committees. The pro-ballot measure committees have received about $424,000 in donations this year. Petitioners submitted signatures for proposed ballot measures 75 and 78 on Aug. 8, the day they were due. The Secretary of State will declare the signatures sufficient or insufficient by Sept. 8. If the office confirms petitioners collected about 98,500 valid signatures for each measure, they’ll appear in the November election. Measure 75 would amend the state constitution to allow local control of oil and gas development, effectively overturning the Colorado Supreme Court’s denial of Fort Collins’ fracking moratorium and Longmont’s fracking ban. Measure 78 would amend the state constitution to increase setbacks for oil and gas development from 500 feet to 2,500 feet from occupied structures. The measure would also require a 2,500-foot setback from “areas of special concern,” a category that includes most water sources and riparian areas, parks, sports fields, playgrounds and public open spaces. Two committees are working on each side of the proposed ballot measures: Yes for Health and Safety Over Fracking and Yes for Local Control Over Oil and Gas are on the pro-ballot measure side. Protecting Colorado’s Environment, Economy and Energy Independence and Vote No on 75/78 are on the anti-ballot measure side. About 30 percent pro-ballot donations were in the form of services from organizations like Food and Water Watch and Greenpeace. Those services are assigned cash values for record-keeping purposes. The committees could see a cash infusion if they’re approved for the ballot, Toro added. Committee representatives weren’t available for comment. The anti-ballot measure committees have received about $15 million in donations this year, not including about $746,000 Protect Colorado had on-hand on Jan. 1. About 10 percent of those donations were in the form of services. The anti-ballot measure committees have spent 20 times more than the pro-ballot measure groups as of Aug. 1 — $5 million versus about $250,000, according to data from the Secretary of State’s office. Also as of Aug. 1, the anti-ballot measure side had roughly $9.1 million to the opposition’s $43,000. Lists of top monetary donors for each side of the issue give you a good idea of how their fundraising has taken shape. Top donors make up 52 percent of 2016 contributions. Top donors make up 85 percent of 2016 contributions. The American Petroleum Institute, the national trade group representing the oil and gas industry, funded about $1.1 million worth of consulting and other services for Vote No on 75/78 but isn’t on this list because the donations were considered non-monetary. American Petroleum Institute (API)Anadarko PetroleumBayswater Exploration and ProductionColorado Ethics WatchColorado Rep. Jared PolisNoble EnergyPDC EnergySynergy Resources CorporationWhiting Oil and Gas Corp.
What does this “complete rethinking” look like? More fossil fuels. And less environmental regulation. A Trump administration would follow the same rhetorical stance on energy as the RNC and the Romney campaign, and the Bush administration’s policy playbook. The 2016 Republican presidential nominee cited “energy reform” as a priority midway through the speech, attacking “the Obama-Clinton war on coal” and boasting how his own plan to cut regulations on the fossil fuel industry would create jobs. Beyond vague anti-regulatory rhetoric, Trump’s speech cited studies from the Koch-funded Institute for Energy Research, the Exxon-funded Heritage Foundation, and the American Petroleum Institute, all purporting to prove the economic ruin wreaked by the Obama administration’s environmental actions. While Trump may not be able to accomplish all of his stated energy agenda, these policy highlights are essentially the same as the energy plan he outlined in May. His vision lines up almost perfectly with that of the fossil fuel industry. Trump would “immediately cancel” President Obama’s executive actions, singling out the Climate Action Plan and the Waters of the United States rule. Trump doesn’t mention that the Climate Action Plan’s carbon rule would lower electricity bills and the Waters of the U.S. rule actually helps protect small farmers against pollution from big agribusiness. He promises to “save the coal industry” — though international coal market dynamics are to blame and U.S. coal jobs are not coming back even with a President Trump. Bringing back the Keystone XL pipeline and drilling on the Outer Continental Shelf are goals that have been on the conservative drawing board for decades — hardly something that belongs in a completely rethought economic vision. Cancelling the Paris Climate Agreement and defunding U.S. contributions to United Nations climate programs would drag the United States and the world back decades. What the billionaire did not mention on Monday is how much climate change is projected to hurt the global economy: the United States will take a 36 percent GDP hit by the end of the century if its leaders allow it to suffer an unmitigated climate, according to research from ICF International and NextGen Climate Action. Globally, that number jumps to $44 trillion by 2060, according to Citigroup.